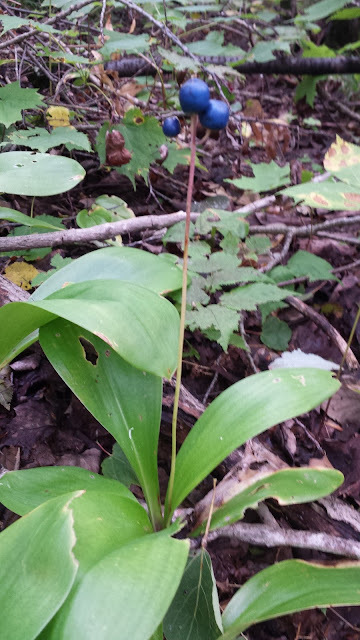 PhytoChemia's Blog: Introducing plants from the boreal forest of Quebec, Canada - Card # 5 : Clintonia borealis (Ait.) Raf. Introducing plants from the boreal forest of Quebec, Canada - Card # 5 : Clintonia borealis (Ait.) Raf. Latin name: Clintonia borealis (Ait) Raf. Common names: Yellow Clintonia, snake poison, bluebead-lily. In the boreal forest of Quebec, Canada, it's possible to find this very common plant. Clintonia borealis is a perennial herb of the lily family. The plant has small blue fruits located on a long flower spike and between two and five basal leaves in general1. Some scientific studies have been conducted on this plant to know its biological potential. The ethanol extract of the leaves of C. borealis is deemed to show significant antifungal properties against Microsporum gypseum2and Trichophyton mentagrophytes2 and antimicrobial activity against Staphylococcus aureus3 and Candida albicans3. The roots, like the leaves, have also been reported in the literature to possess antifungal properties2. Further researches focused on the antioxidant potential of the berries of this plant. These studies showed a low antioxidant potential in laboratory tests by "DPPH antioxydant assay" showing an IC50 = 162.50 ± 10.76 mg / mL4. For obtaining a high antioxidant activity in this test, it must has a IC50 below 50μg / mL. Other properties of C. borealis were also reported in the literature, such as helping to parturition (action to give birth in mammals), for the treatment of injuries and infections5 and identified as an insect repellent5. 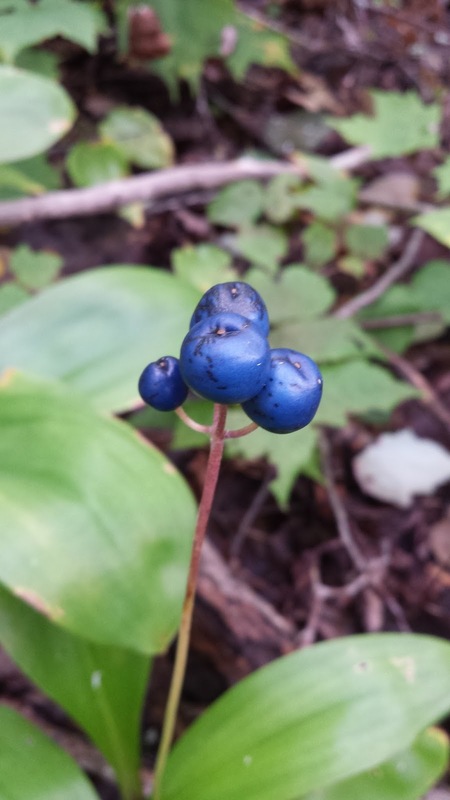 A decoction of the clintonia's berries (extraction of active compounds in boiling water (same process as a herbal tea)) was, apparently used by the Iroquois to treat diabetes4. In Quebec popular folklore, these fruits are still considered toxic and are inedible. Actually, no study has been listed on the toxic properties of these fruits. Ingesting these berries is not recommended and at your own risk! On other hand, the young leaves of this plant are considered good for human feeding. From a chemical point of view, clintonia contains various phytosterols such as campostérol, stigmasterol and β-sitosterol, chalcones8 and triterpenes such as α-amyrin, β-amyrin and the taraxasterol9. In addition, the C. borealis was previously considered as a potential source of diosgenins10. Recently, new steroidal glycosides11 and spirostanol12 were found in two very similar species of Clintonia udensis Trautv. and C. A. Mey. Like many plants from the boreal forest of Quebec, Canada Clintonia borealis is still not very much studied scientifically for its biological potential. There are still many discoveries to be made about it! (1) Marie-Victorin. Flore Laurentienne, 3e ed. ; Gaëtan Morin éditeur: Montréal, 2002. (2) Fulcher, R. G.; Borchardt, J. R.; Wyse, D. L.; Sheaffer, C. C.; Kauppi, K. L.; Ehlke, N. J.; Biesboer, D. D.; Bey, R. F. Antimicrobial Activity of Native and Naturalized Plants of Minnesota and Wisconsin. J. Med. Plants Res. 2008, 2 (5), 98–110. (3) Jones, N. P.; Arnason, J. T.; Abou-zaid, M.; Akpagana, K.; Sanchez-vindas, P.; Smith, M. L.; Nation, G. R. F.; Marie, S. S.; Canada, P. A. Z. Antifungal Activity of Extracts from Medicinal Plants Used by First Nations Peoples of Eastern Canada. J. Ethnopharmacol. 2000, 73, 191–198. (4) Atha, D. E.; Ma, J.; Nee, M. H.; Kennelly, E. J. Antioxidant Capacities of Ten Edible North. Phyther. Res. 2002, 16 (June 2001), 63–65. (5) University of Michigan - Dearborn. Native American Ethnobotany. (6) Barker, M. Newer Cosmetic Ingredients - New Patch Testing Problems? Am. J. Contact Dermat. 1998, 9 (2), 130–135. (7) Ohnogi, H.; Sugiyama, K.; Muraki, N.; Sagawa, H.; Kato, I. Remedies. EP1563841 A1, 2005. (8) Ohnogi, H.; Sugiyama, K.; Muraki, N.; Enoki, T.; Sagawa, H.; Kato, I. Chalcone Compound. US7361774 B2, 2008. (9) Hooper, S. N.; Chandler, F. Herbal Remedies of the Maritime Indians: Phytosterols and Triterpenes of 67 Plants. J. Ethnopharmacol. 1984, 10, 181–194. (10) Marker, R. E. Sterols. CXLVI. Sapogenins. LX. Some New Sources of Diosgenin. J. Am. Chem. Soc. 1942, 64 (6), 1283–1285. (11) Matsuo, Y.; Watanabe, K.; Mimaki, Y. New Steroidal Glycosides from Rhizomes of Clintonia Udensis. Biosci. Biotechnol. Biochem. 2008, 72 (7), 1714–1721. (12) Mimaki, Y.; Watanabe, K. Clintoniosides A - C, New Polyhydroxylated Spirostanol Glycosides from the Rhizomes of Clintonia Udensis. Helv. Chim. Acta 2008, 91 (11), 2097–2106.